Brit Bennett is a novelist and essayist. 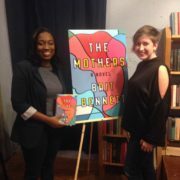 Her debut book, The Mothers, centers on a young woman from a tight-knit church community who has an abortion. Interspersed throughout, the elderly women of the church, “the mothers”, add narration to the book in a collective voice. Bennett graduated from Stanford University and later earned her MFA in fiction at the University of Michigan, where she won a Hopwood Award in Graduate Short Fiction as well as the 2014 Hurston/Wright Award for College Writers. Her work is featured in The New Yorker, The New York Times Magazine, The Paris Review, and Jezebel. She is one of the National Book Foundation’s 2016 5 Under 35 Honorees. Judy T. Oldfield: The thing that first jumped out to me when I was reading about The Mothers, months ago, was this narrative device you use, the plural voice that’s been likened a lot to a Greek Chorus. Was that in there from the beginning, when you wrote the book? Brit Bennett: No, it was something that happened accidentally. I think originally there was just this person—voice—that I was writing in that still seemed like it didn’t really belong to the characters. It was this omniscient voice…that felt a lot older than the characters were and it wasn’t really located anywhere. I think [it] was my second year of my MFA when I started thinking about locating that voice…and I said, What would happen if I actually wrote this in this collective voice? It was something that I was skeptical of myself because I didn’t want it to be like I was trying to be cute with plural narration, because I am sometimes skeptical of it as a reader…But it was something that I had a lot of fun writing from that perspective. And I think it added another layer to the book that wasn’t there before. JO: Did that help you shape the narrative? Did that bring things together for you? BB: Yeah, a bit…Later in the book when Nadia begins to drive the mothers around, that’s something that wasn’t there originally but I became interested in that because I liked the idea of [the church mothers] being the narrators and then sneaking in through the back door and being narrated about. So them narrating Nadia narrating them. That was something that came about later that was affected by that narrative choice. JO: And the way the themes of stories that aren’t always our stories, how those stories get made. BB: Right…This idea about church folks gossiping. That was already a theme. This idea of gossip is, you know, just telling stories about other people, which is also what you do when you write fiction. So I think that thematically the mothers always existed in that space. But by embodying that voice and characters I think I was able to access something that I hadn’t before. JO: You began writing [The Mothers] in college and then workshopped the book through your MFA. In what other ways did it grow and change as you grew and changed both as a person and as a writer? BB: It changed a lot…Originally, it all took place in the immediate aftermath of Nadia’s pregnancy and abortion. It took place that summer. But as I got older, I became interested in what the characters would be like when they got older. I started thinking of coming of age as not something that happens in just one moment but something that happens throughout your life…I was like, so what would these characters be like when they go to college, what about after they go to college? JO: It centers on abortion, and the What Ifs that surrounds something like that. As you were first writing it, that must have been, what 8 years ago? Have you noticed people’s views, society’s views, changed? And did that influence the course of the book? BB: That’s interesting. I mean I think when I first started I was never that interested, and I think I remain rather uninterested, in the actual politics of it…To me it wasn’t a politically controversial decision. I just knew this was the decision she was going to make. I came of age and political consciousness in the [George W.] Bush presidency and I remember abortion being such a hot-topic issue in a way that in this election it hasn’t been much of an issue, in spite of the fact that there are a lot of states that are rolling back access at a pretty rapid rate. I think aside from that last presidential debate, I don’t remember it even really being brought up in a sort of major way in the national stage…I don’t know how much that influenced the actual writing of the book. I mean, I think characters in the book feel a lot of different ways about this, like the way people do in real life. JO: You also tackle subjects of infidelity and race in the book, which is our job as writers, as artists, to confront these issues. But are you ever reluctant to tell people in your life about what the book is about? BB: [laughs] I think writing a book that starts with abortion creates a lot of awkward encounters with strangers. Usually if you tell someone you’re in town for a book reading they’re going to ask you what your book is about. And then you’re having this conversation with a stranger, whose politics you don’t know about this polarizing issue. Not to mention the other themes of the book, as you pointed out. I think that it’s something I’m starting to realize now that the book’s out in the world. [It] is pretty weird and pretty uncomfortable but I just keep telling myself, yeah, you chose to write about this so you gotta be brave enough to handle the awkwardness socially when you’re talking to people. JO: Did you grow up in a similar setting to the book? I know you grew up in California, but in church community? BB: Yeah, I mean not the same way that these characters did. The church that I grew up going to was a lot larger…I really liked the idea of setting [The Mothers] in a small church. I think about sometimes, shows like Friday Night Lights which is so great in forcing characters to be around each other…Whether it’s the football team, or the locker room, or the Chili’s or TGIFriday’s or wherever they went after the games, they constantly force these characters to be around each other in these spaces. I think that’s when fiction gets really interesting. To me the problem with a larger church was that you can escape people too easily. But these smaller churches, people will notice if you weren’t there last week, people will comment on it, people will talk about your life, they know your business. So, I had to base it off a church that wasn’t like the one I grew up in. But I did grow up in Oceanside, this sort of beach town, military town, and I did grow up going to church. JO: On Penguin’s website, they label The Mothers as both literary fiction and women’s fiction. What do those labels mean to you? BB: [laughs] Not much. I think “women’s fiction” does make me giggle a little bit because I’m like, “What is that, even?” Is it just a book about a woman, is it if you’re a woman writing it? It’s the same thing with “African-American fiction.” If a white person writes a book about black characters, is that African-American fiction? Or if a black person writes a book about white characters, is that African-American fiction? I don’t know. I don’t think too much about it. I think these are largely marketing terms that are useful for publishers and not really for readers. JO: You had an unusual experience landing your agent. A lot of people who write essays can’t write fiction. So she really had no reason to think that the novel would be good. But then, yeah, she finally read it and loved it and called me and we talked and it went on from there. JO: So do you have a book of essays in you? BB: I hope so. At some point. Not right now. But I do hope to one day write a book of essays. I think that would be really fun. JO: [In] your essays that you have published, you write a lot of about race and race portrayals in the media. You don’t offer a lot of solutions. BB: Well, I think I don’t want to write about anything unless it’s beginning as a question or something I’m wondering about or struggling with. I really hate reading essays that you can really tell from that first paragraph exactly how the writer feels. Like, why do I want to read this? I know exactly what your stance is. Like, why is this interesting to me? I think essays are the process of watching somebody think. And I feel like the role of the essayist is to guide the reader through their thinking. Not to just be like, This is how I feel and these are all the reasons why in these bullet points. JO: And this is why you should think like this. BB: Right. And this is why you should agree with me. That’s the piece I hate the most. So I do think a lot of my work is very ambivalent because usually I’m writing about something if I’m trying to figure out how I feel about it, or questioning it, or if something that challenges myself. I think that’s what’s interesting. BB: Well, probably not. But I am really excited about that. And that story…I had another conversation with somebody I just met about that in Boston. And I’m just in awe over the plot points I remember from that Addy series of these books I read once when I was like ten or whatever, and remember more about that series and the way it depicted slavery and the Civil War than actual textbooks that I studied in college. It’s weird to think of the ways in which narrative is so formative of our experiences and the ways we come to understand things. So yeah, I wish I had a young girl in my life that I could give Melody to. I don’t really have children around me but yeah, it’s exciting. People will sometimes message me about doll things after I wrote that essay. So the Ava DuVernay Barbie and Melody and all of these exciting black girl dolls that exist now. [I’m] happy for the young girls now who have so many options. JO: But I’ve been waiting for an American Girl Doll from Detroit for a very long time. Brit Bennett graduated from Stanford University and later earned her MFA in fiction at the University of Michigan, where she won a Hopwood Award in Graduate Short Fiction as well as the 2014 Hurston/Wright Award for College Writers. Her work is featured in The New Yorker, The New York Times Magazine, The Paris Review, and Jezebel. She is one of the National Book Foundation’s 2016 5 Under 35 Honorees. Judy T. Oldfield’s work has appeared or is forthcoming in The Stranger, Ghosts of Seattle Past, Gravel, Cleaver, The Portland Review, and many others. She grew up in the Metro Detroit area and attended Western Michigan University, where she earned her B.A. in English and Comparative Religion. Judy lives in Seattle where she is engaged in an ongoing battle with the invasive blackberries in her backyard. Find her on Twitter @J_T_Oldfield.